Unlock Your Muscle Gene is written by Ori Hofmekler, who is also the author of “The Warrior Diet” and “The Anti-Estrogenic Diet”. The purpose of this book is to expose the myths associated with fitness and to provide a system based on the true fundamental principles of physical conditioning. According to him all you need is to know what the real triggers of muscle building are and what you need to do to turn on this natural muscle-building mechanism. Ori Hofmekler explains that there are certain nutrition and exercise protocols that have been shown to help build muscle, maintain health and promote longevity, while others have the opposite effect. Unfortunately due to a lack of knowledge most of us have no idea what is the right approach. There are five essential components of a nutritional protocol to build muscle. Finding the right protein for your muscle. Controlling the glycemic impact of your meals. Choosing the right fuel for the needs of your muscle. Making sure you are eating the right food at the right time and in the right amount. Increasing your antioxidant defenses to ward off muscle degradation. One of the fundamental principles of the muscle growth diet presented in this book is that it is beneficial for us to eat light and raw foods in the daylight hours, while the evening meal should be more dense and cooked. This dietary structure allows us to remove toxins, burn fat, and stay alert during the day. And at night it will promote replenishment of nutrients, rejuvenation, relaxation, and sleep. It also improves the activity of insulin in our body, helps to keep appetite under control and maintains the optimal function of our hormonal and metabolic systems. Advice is also provided on what you should eat after exercise, recommended antioxidant supplements, and calorie restriction or intermittent fasting for longevity. Whey protein, yogurt, kefir, eggs, organic cheese, grass-fed meat, free-range chicken, wild-catch fish, legumes, seeds, grains, berries, pomegranates, bananas, green vegetables, coconut, almonds, pistachios, cashews, chia seeds, avocado, dark chocolate. Ori Hofmekler asserts that humans are programmed specifically for short intense bursts of exercise because these are the types of activities that were essential for the survival of our species. This type of training yields the best results in terms of muscle building and prevention of aging by various mechanisms including sparing the muscle mitochondria from damage, increasing your muscle’s glycogen-loading capacity, and improving your muscle fiber quality. Your workouts should combine strength, speed, and endurance while preferably including explosive elements. For example, you may combine heavy weight training with speed punching or combine squat exercises with sprinting. For best results your workouts should never exceed thirty minutes. 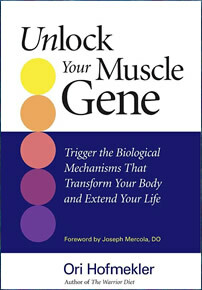 Unlock Your Muscle Gene: Trigger the Biological Mechanisms That Transform Your Body and Extend Your Life retails at $17.95. Encourages consumption of a variety of fresh, unprocessed whole foods. Can help dieters to build muscle and lose fat. This muscle growth diet is based on scientific research. Workouts never need to go over thirty minutes. Diet requires discipline and a fair amount of attention to detail. Dieters will probably experience hunger with the daytime light-eating regime. Unlock Your Muscle Gene is a muscle growth diet designed to help you reshape your body and reach your optimal potential for muscle gain. It will appeal to those who are dedicated and willing to make a dramatic change in their approach to diet and exercise in order to achieve a transformation in their physical appearance and health. I was wondering why you have a desert, it usually adds to calories and greatly effects our toned muscles IN A BAD WAY. Please explain this unnecessary component in order for my small mind to understand this “dessert” addition to a perfectly well balanced and healthy meal, thank you!